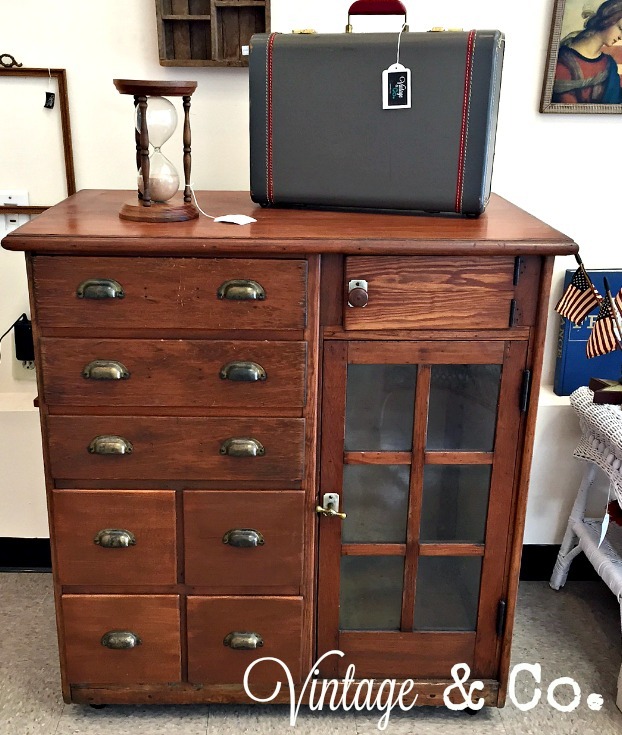 This beautiful 9 drawer dresser sold in a jiffy! I would have loved to have kept this one for myself! 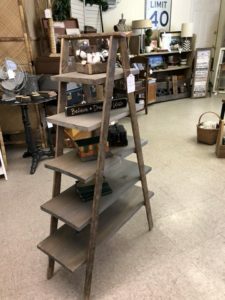 last long…maybe just a day in the shop! 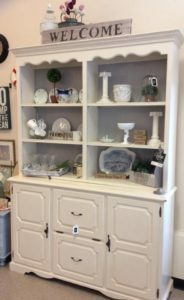 This lovely farmhouse hutch and lower cupboard is amazing! 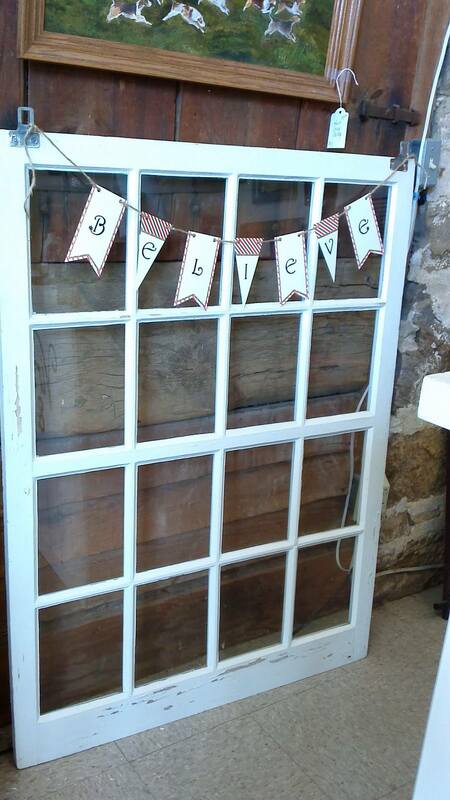 Perfect for homes with high ceilings this sweet piece is over 7 ft tall! Great price, too! 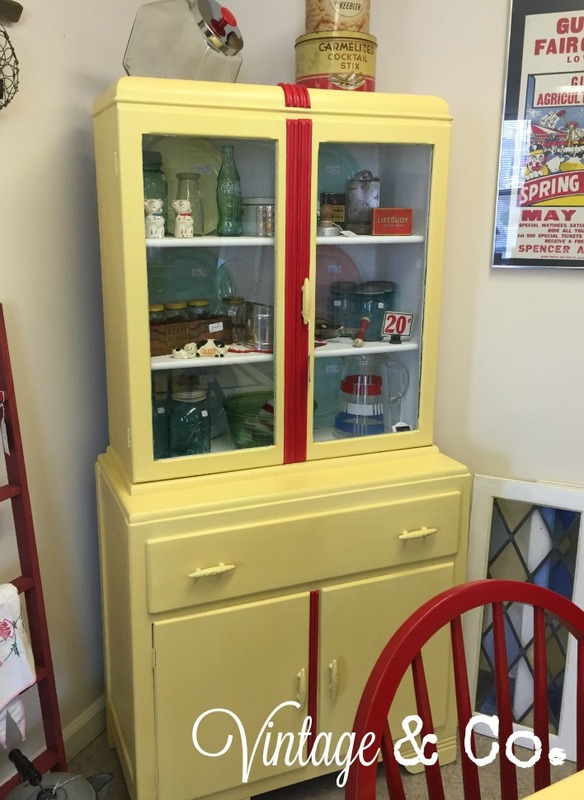 Just $369.00! 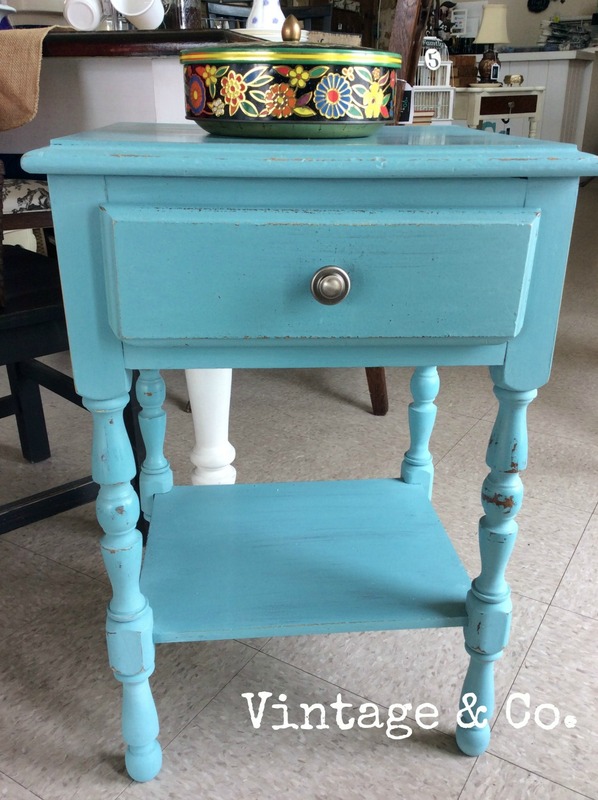 was chalk painted, distressed and waxed for a super smooth finish. 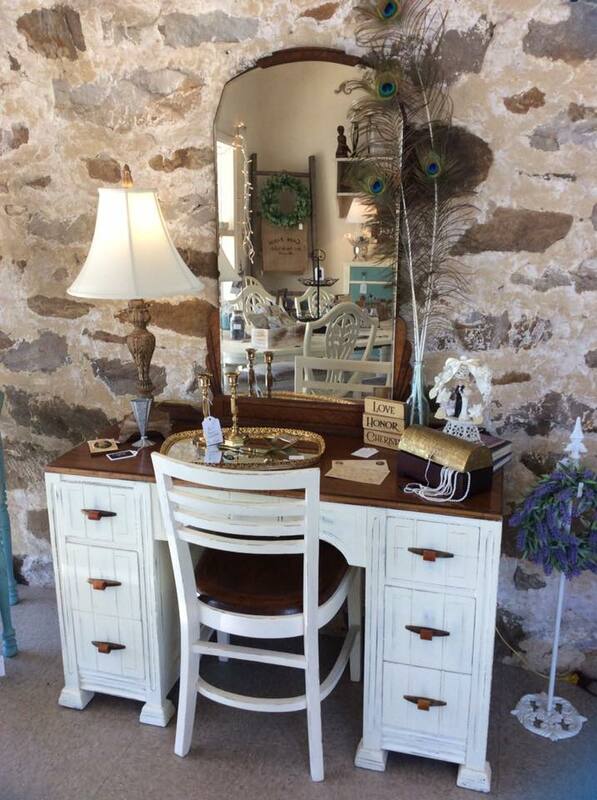 This vintage secretary desk was painted in a cream color, distressed and given a dark wax. 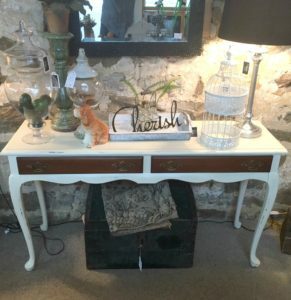 A French hotel themed stencil was added to the front and it all just tied together perfectly! 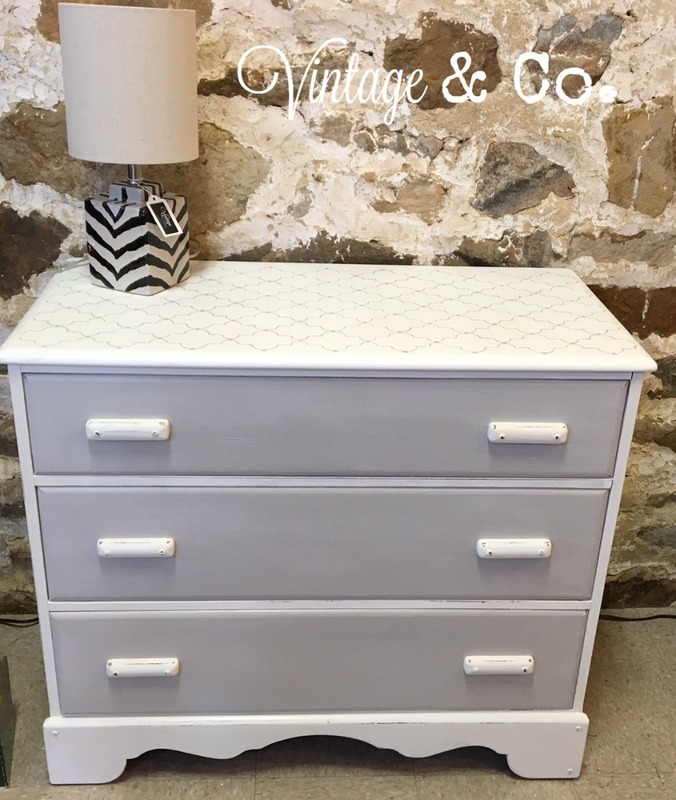 2 drawer chest or night stand I knew what I wanted to do with it. hardware and shined it up to its original brass finish. Love! 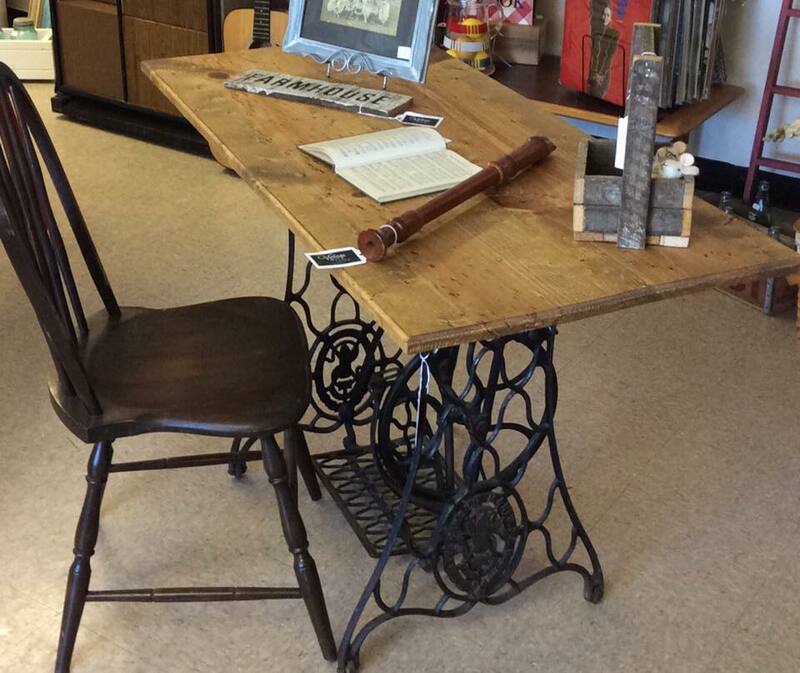 Someone else loved it too because it SOLD! 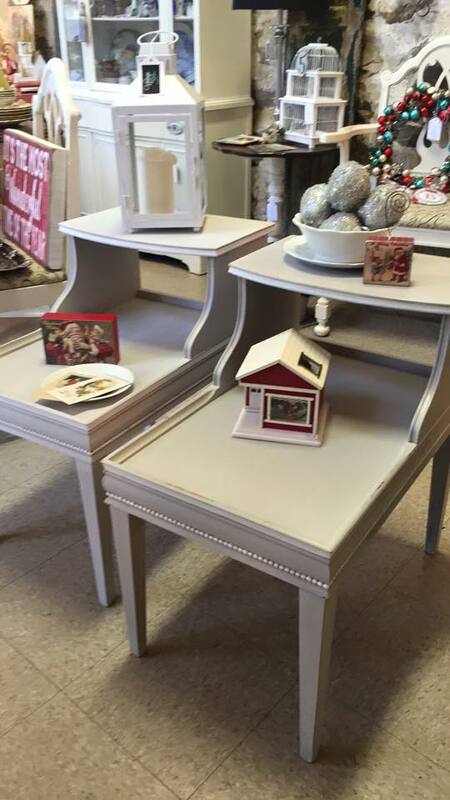 use it in her entryway and store all of her mail, papers, etc in it. 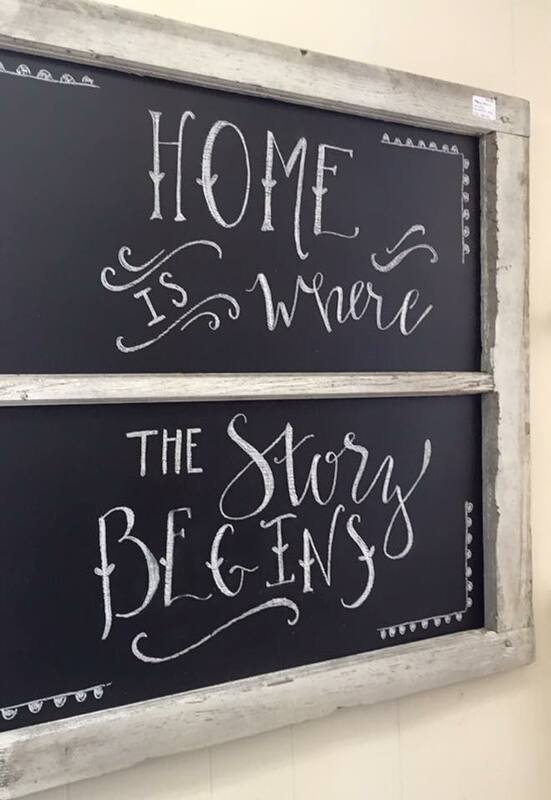 chalkboard paint. 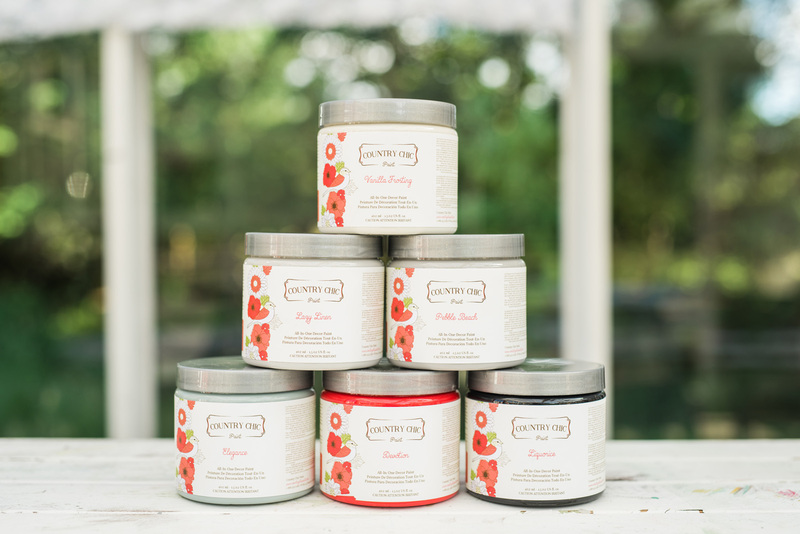 We are so blessed to have an artist on board with us! Her name is Rachel and she does all of our chalkboard writing! and a customer had her eye on them and now they are hers! 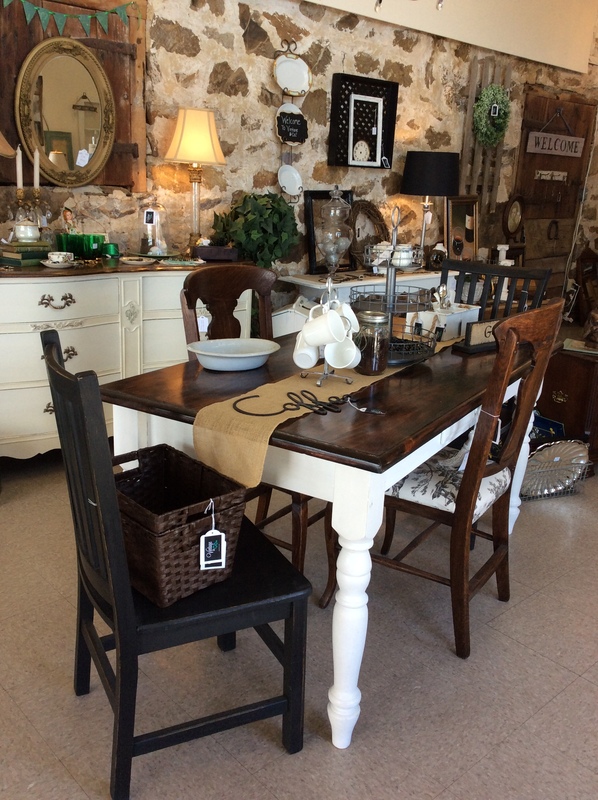 table was filled with rich tones and complimented the off-white nicely. 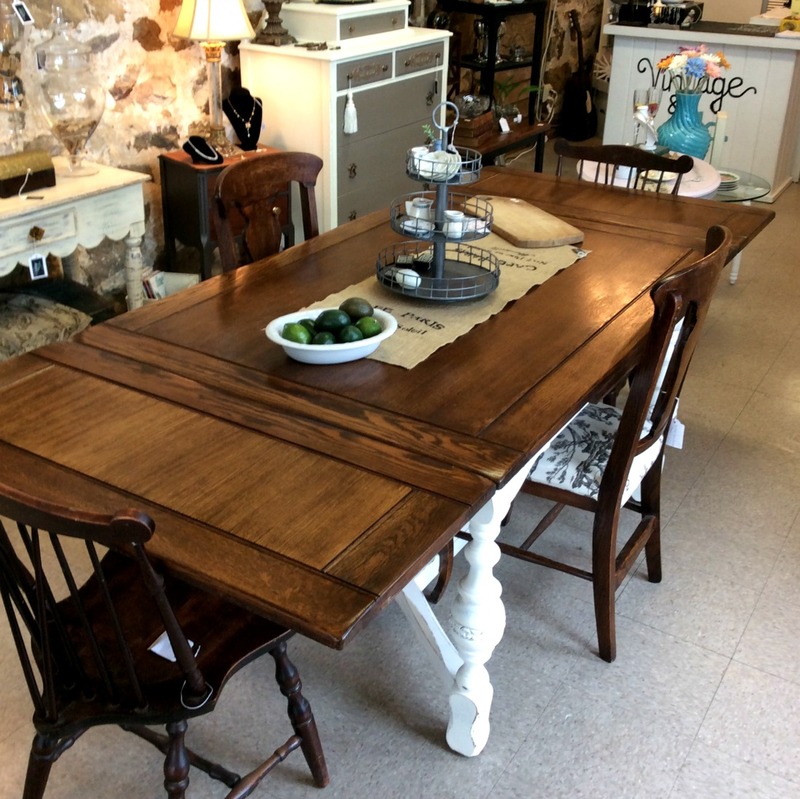 A couple is moving into their new home and chose this table set! are the six chairs that went along with it. 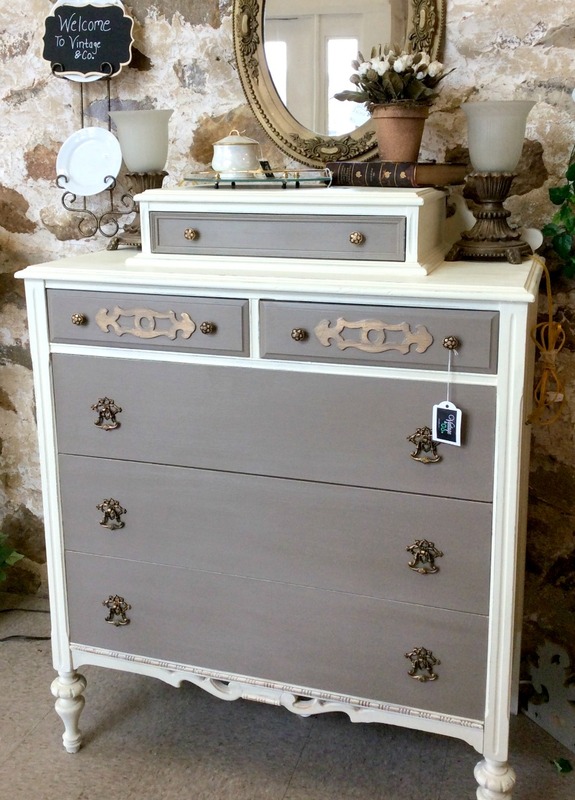 This beautiful antique dresser did not last long either! It was one of our favorites! 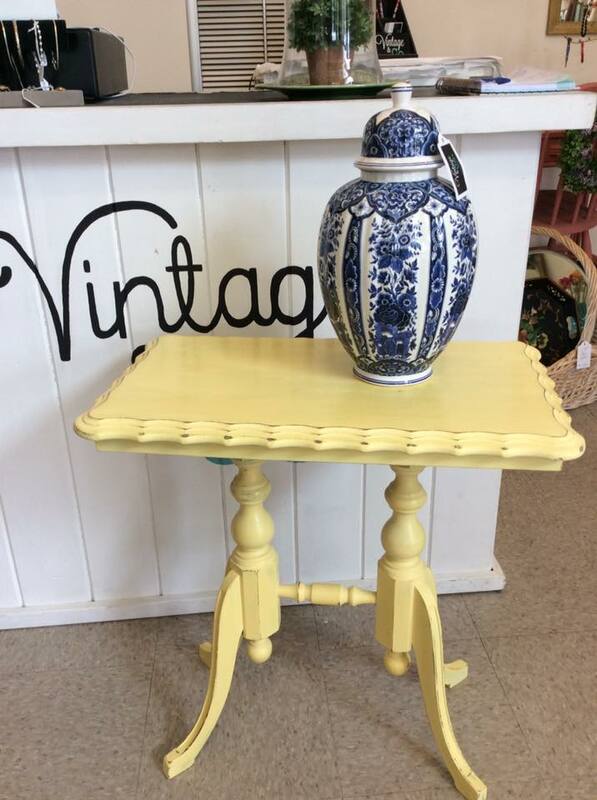 just like this yellow side table. Off to a new home! The blue and white ginger jar sold, too. 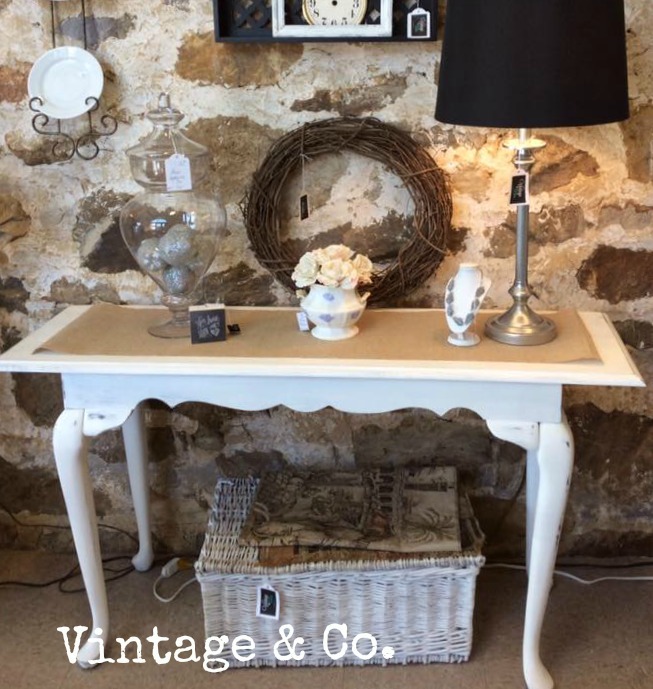 This was a “vintage” mahogany sofa table that needed to be updated. 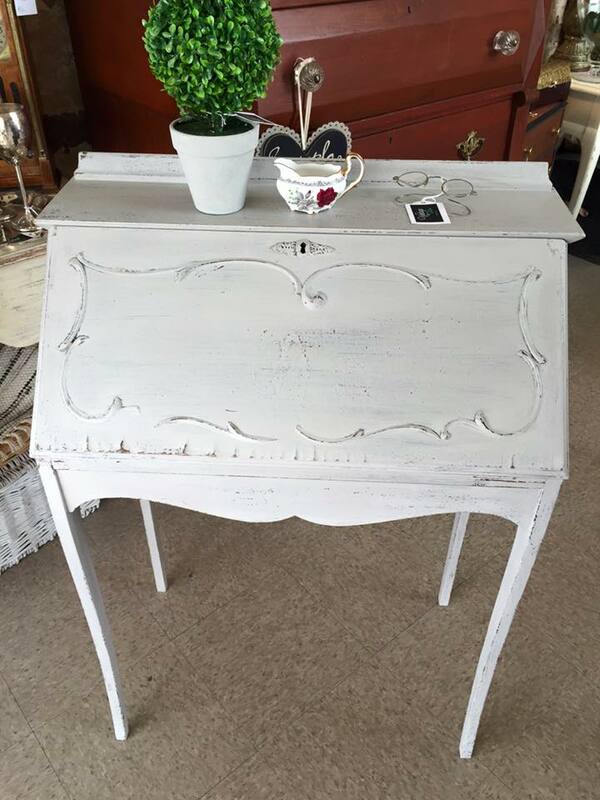 We gave it a coat of white chalk paint and distressed it in all the right places. Went to a great home! 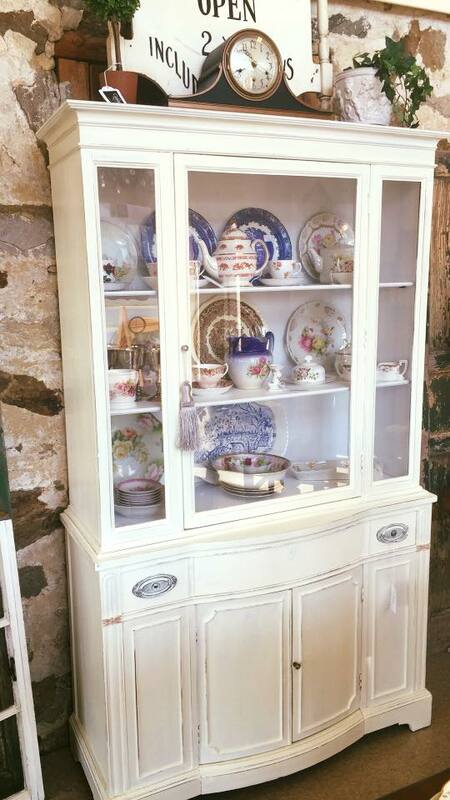 This beautiful china cabinet held a lot of the things you need for entertaining. 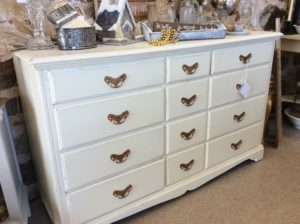 It was painted in a creamy, ivory chalk paint and is now in its new home! the wooden top was made a little larger. didn’t last long. Good thing is, we can create another, just for you! 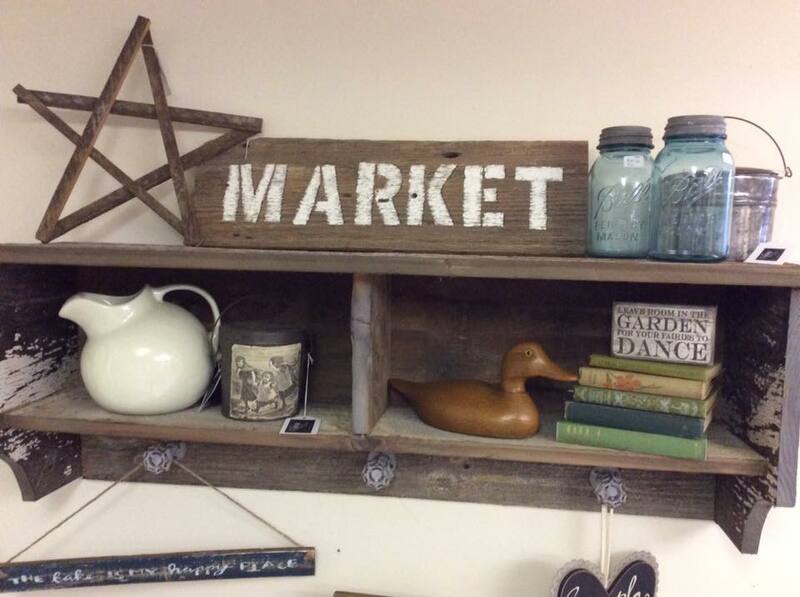 Let us know if you are interested in a piece like this. 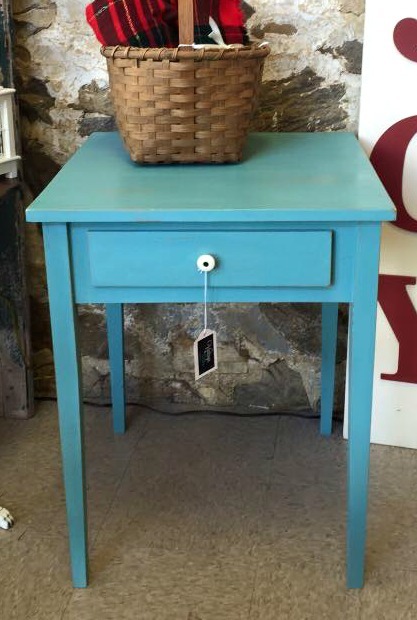 Another sweet aqua side table, sold! I personally love this color! 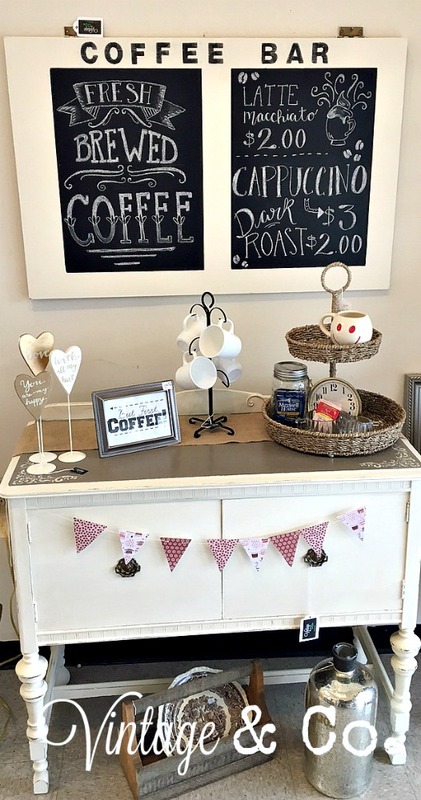 We had so much fun with this coffee bar set! kept it for her own home. 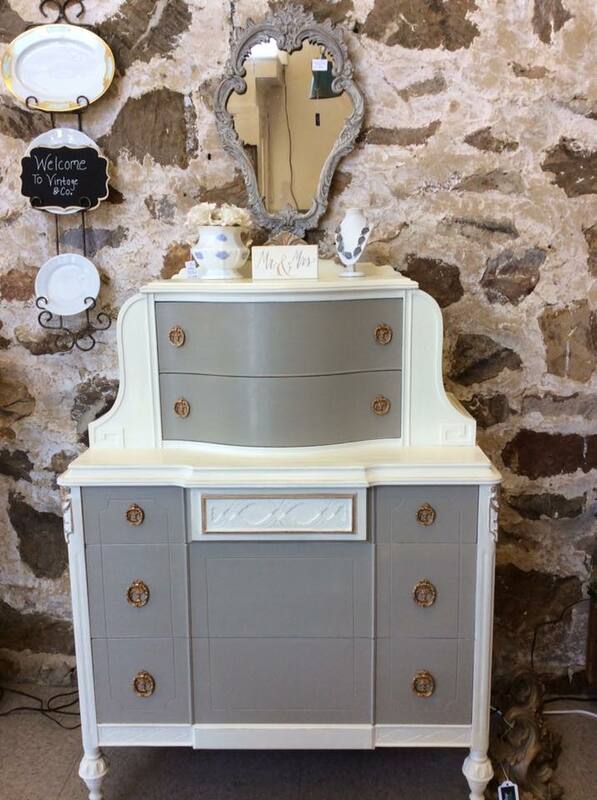 Another beautiful dresser, SOLD and going to a new home. worked on. 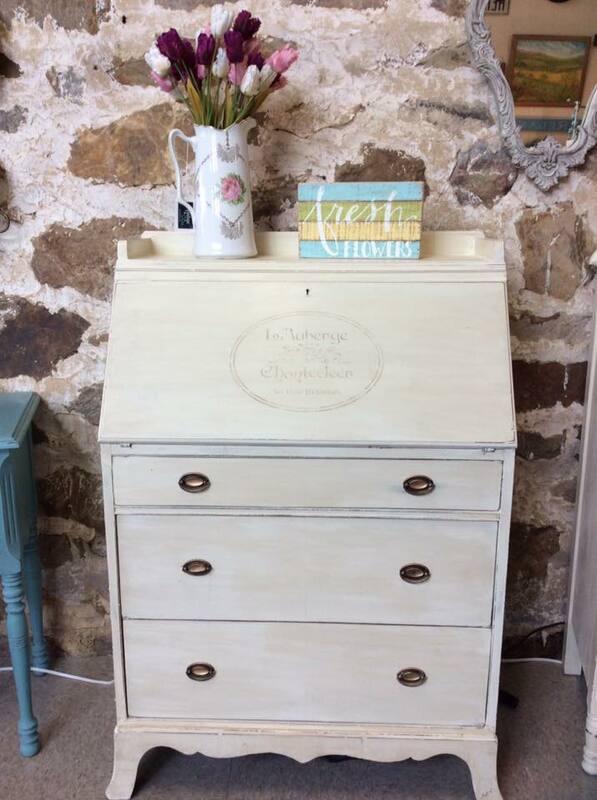 With cream chalk paint, the original drawers just seem to POP! 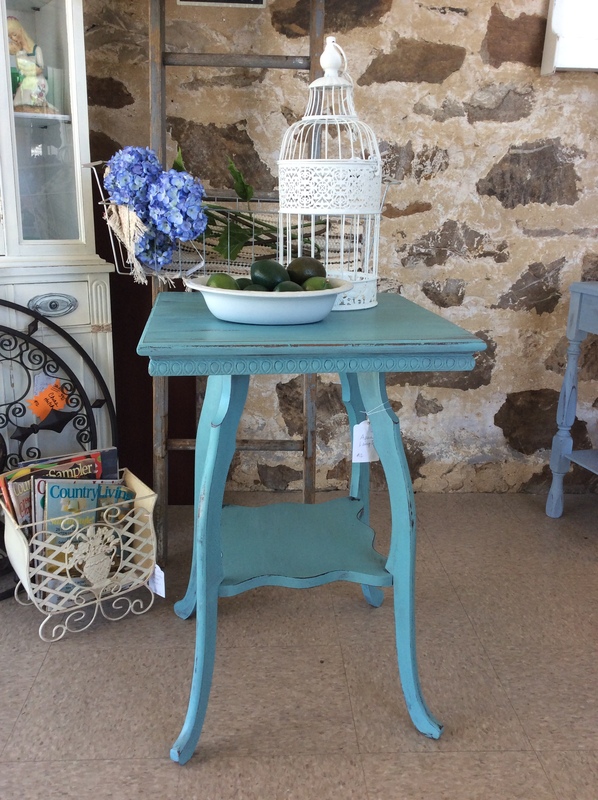 This antique table received an aqua chalk paint treatment with some distressing. Like I’ve said before, I enjoy painting with this color! And it too, has SOLD. window and the new owner is thrilled now, too! not too small, and went to a good home ! decorating their new home together. 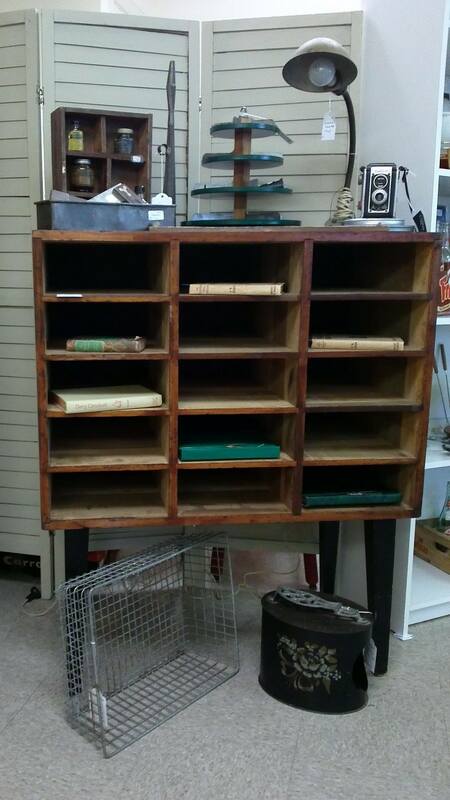 This industrial mail bin / paper organizer was so cool! And off to its new home. possibly used in a doctor’s or dentist’s office long ago. 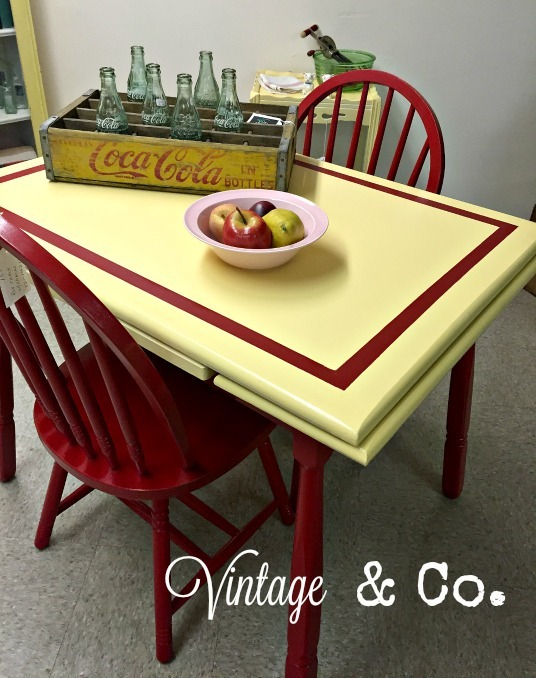 The fellow vintage lover just loved it and it has a new use now! Duncan & Phyfe legs sold very quickly! It had a large surface area of 26″. The new owner just loved it. 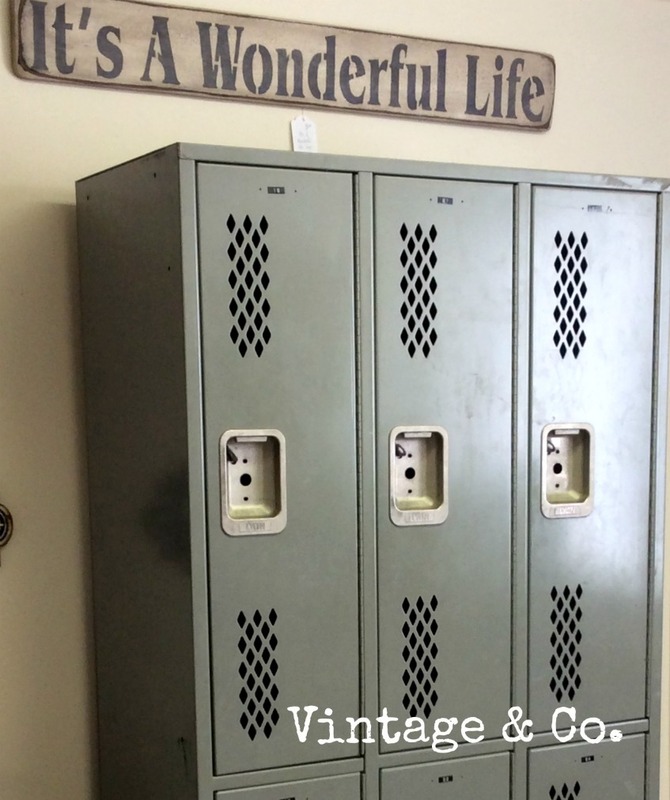 by a vintage lovin’ couple… we’re excited our vision was their vision, too. customer agreed! She is enjoying it now in her home. was super cool. 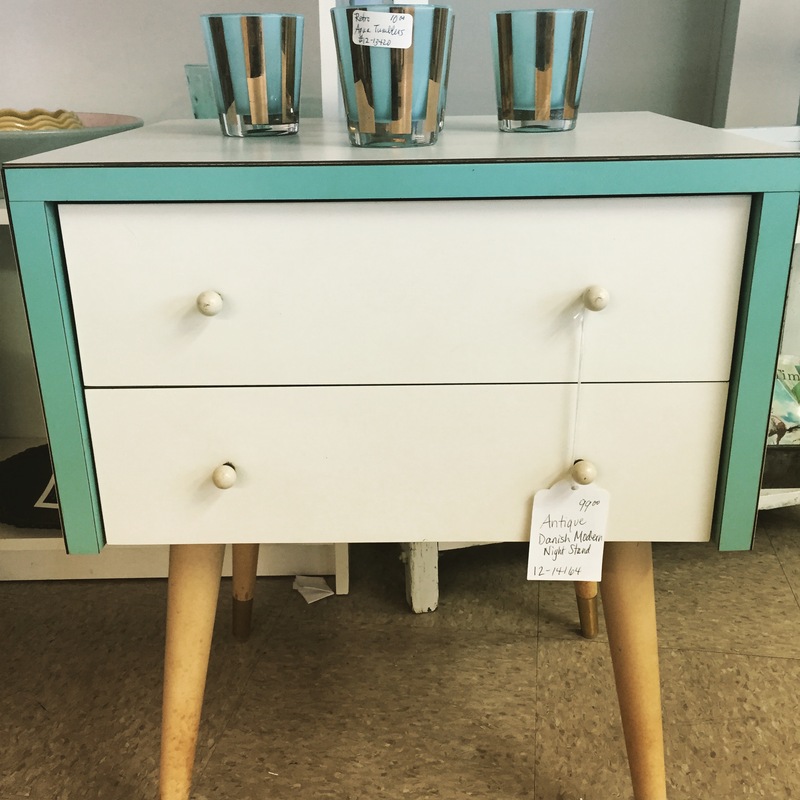 It is going to be used in a beach themed room. couple who originally owned the where our shop is now. 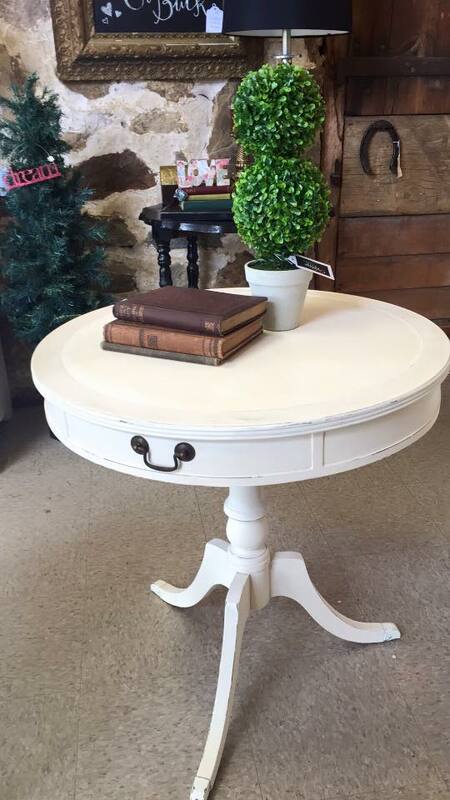 I was so happy they bought it for their new home! 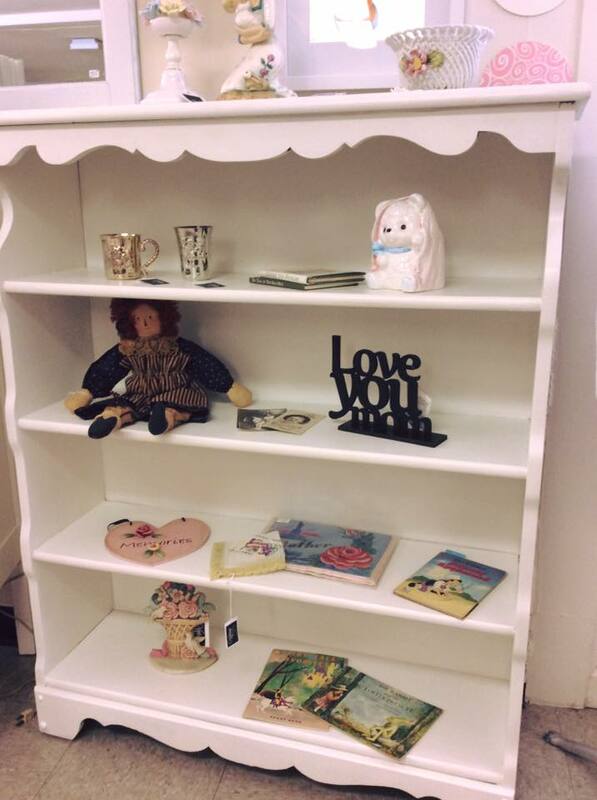 This sweetheart of a bookcase went to a home of a book lover. 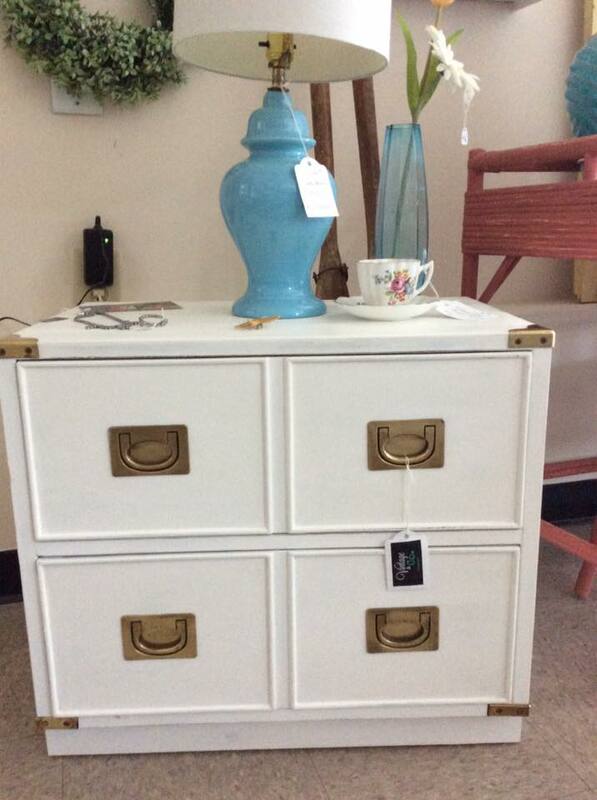 Perfect pairing… we love to find good homes for all of our pieces! menu tab and send us a message.